Elon Musk, chief executive of Tesla, has published the second part of his self-titled "masterplan". He said Tesla would be branching out into creating a "solar-roof-with-battery product" that people can have fitted to their homes. He wants the Tesla electric car range to cover all types of ground vehicles, specifically buses and lorries. And once the cars have full autonomous driving capability, Mr Musk said Tesla would allow owners to add their cars to a shared fleet, meaning the vehicles can be making money for their owners when they are not using them. Mr Musk had teased the publication of the plan on Twitter for several days, recently saying he'd pulled an all-nighter in order to finish it. His ambition, he wrote, was to "accelerate the advent of sustainable energy". "We must at some point achieve a sustainable energy economy or we will run out of fossil fuels to burn and civilization will collapse. "Given that we must get off fossil fuels anyway and that virtually all scientists agree that dramatically increasing atmospheric and oceanic carbon levels is insane, the faster we achieve sustainability, the better." 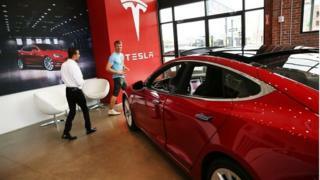 Mr Musk's plans have, though, drawn criticism from analysts, who suggest they are too vague. "As is typical, Elon Musk has laid out a grandiose plan for the future with no timeframes and few specifics, and no mention of how and when Tesla will be profitable," Michelle Krebs, senior analyst at Autotrader, said. She added that while Tesla's latest plan included expanding its electric vehicle product line to cover all major segments, "it hasn't been meeting production targets with the limited product line it has now and in the next couple of years". The masterplan comes comes at a time when Mr Musk is facing criticism for the roll-out of Tesla's Autopilot feature, in which cars autonomously travel along motorways, changing lanes and speeding up or down in keeping with traffic. US road safety regulators are investigating whether Autopilot was at fault in a crash which left one man, the driver, dead. The software appears to have failed to spot a white lorry driving across the Tesla's path. Mr Musk stressed in his masterplan that Autopilot was in beta mode, and that all drivers are warned of that. He wrote: "It would no more make sense to disable Tesla's Autopilot, as some have called for, than it would to disable autopilot in aircraft, after which our system is named. "It is also important to explain why we refer to Autopilot as 'beta'. This is not beta software in any normal sense of the word. Every release goes through extensive internal validation before it reaches any customers. "It is called beta in order to decrease complacency and indicate that it will continue to improve (Autopilot is always off by default). Once we get to the point where Autopilot is approximately 10 times safer than the US vehicle average, the beta label will be removed." Mr Musk was also under pressure to explain the reasoning behind Tesla's purchase of SolarCity, a solar-power company that many considered to have been struggling. Mr Musk was its chief executive, and some investors said Tesla's purchase was essentially bailing out the ailing SolarCity. However, Mr Musk rationalised his thinking by saying his vision of sustainable energy in our homes required the two companies to be joined. "We can't do this well if Tesla and SolarCity are different companies, which is why we need to combine and break down the barriers inherent to being separate companies." Mr Musk also seemed to suggest his company would one day compete with the likes of Uber and Lyft for personal transportation. Once the cars had achieved full, safe autonomy, he said, a service would be set up that allowed owners to make their cars part of a fleet others could summon via an app. In cities where there were too few Tesla owners to satisfy demand, Mr Musk said Tesla would "operate its own fleet, ensuring you can always hail a ride from us no matter where you are". Shares in Tesla were marginally up during out-of-hours trading.